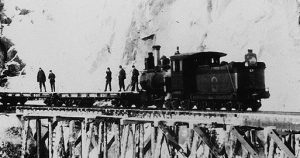 Stonecliff, an original musical about the building of a railway from Skagway into the Yukon during the Klondike Gold Rush by Michael J. Heney, Alaska’s “Irish Prince”, will perform at the Wendy Williamson Auditorium November 10-12. Playwright Conrad Boyce (also Director and Producer) joins Stage Talk this week via phone line from Whitehorse, Yukon where the play is currently in rehearsal. Listen in this week to find out about one of Alaska and Canada’s more interesting historical figures as well to find out more about this exciting musical. Stonecliff with music by Matthew Lien is making its world premier in Anchorage. ORIGINAL BROADCAST: Friday, November 3 at 2:45 p.m.